The L3-HAPLS advanced petawatt laser system has been declared fully integrated and operational at the ELI Beamlines Research Center in Dolní Břežany, Czech Republic, and is now ready for integration with the experimental systems and first experiments. After evaluation by an international peer review group, the L3-HAPLS advanced petawatt laser system has been declared fully integrated and operational at the ELI Beamlines Research Center in Dolní Břežany, Czech Republic. The group assessed the laser performance, determined that all performance parameters have been successfully met — capable of reaching the 1 petawatt, 10 hertz (Hz) design specification — and that the system is ready for integration with the experimental systems and first experiments. L3-HAPLS was designed, developed and constructed by Lawrence Livermore National Laboratory’s (LLNL) NIF and Photon Science (NIF&PS) Directorate and delivered to ELI Beamlines in June 2017. Since September 2017, an integrated team of scientific and technical staff from LLNL and ELI Beamlines has worked intensively on the installation of the laser hardware. Leading the L3-HAPLS project allowed LLNL to draw on its decades of pioneering laser research and development and apply that expertise to advance new laser concepts important for its mission as a national laboratory. The system consists of the main petawatt beamline capable of delivering 45 joules (J) of energy per pulse and is energized by diode-pumped lasers, capable of delivering up to 200J of energy per pulse. The system has now been ramped to its first operation point of 16 joules and a 27 femtosecond pulse duration at a 3.3Hz repetition rate (3.3 times per second), equivalent to a peak power of approximately 0.5 petawatt after the pulse compressor. This operational point was established to learn and conduct first experiments at a moderate repetition rate. The collaboration extended beyond just LLNL and ELI Beamlines. By partnering with industry — and drawing on LLNL’s expertise laser research and development — the team delivered key advancements, including the world’s highest peak power diode arrays; a pump laser generating up to 200 joules at a 10 Hz repetition rate; a gas-cooled short-pulse titanium-doped sapphire amplifier; a dual chirped-pulse-amplification high-contrast short-pulse front end; and an energetic gigashot laser pump source for pumping the short-pulse preamplifiers and others. L3-HAPLS will have a wide range of uses, supporting both basic and applied research. By focusing petawatt peak power pulses at high intensity on a target, the system will generate secondary sources such as electromagnetic radiation or accelerate charged particles, enabling unparalleled access to a variety of research areas, including time-resolved proton and X-ray radiography, laboratory astrophysics and other basic science and medical applications for cancer treatments, in addition to industrial applications such as nondestructive evaluation of materials and laser fusion. At Lawrence Livermore National Laboratory, a federally funded research and development center about 50 miles east of San Francisco, scientists at the National Ignition Facility (NIF) are trying to achieve self-sustaining nuclear fusion — in other words, to create a miniature star on Earth. The core of the NIF is a house-sized spherical chamber aiming 192 massive lasers at a tiny target. One recent laser experiment focused nearly 2 megajoules (the energy consumed by 20,000 100-watt light bulbs in one second) of light energy onto a millimeter-sized sphere of deuterium and tritium in a 16-nanosecond pulse. The resulting energetic output, while far short of being a self-sustaining reaction, set a record for energy return, and has scientists hopeful as they fine-tune the targeting, material, and performance of the instruments. The facility itself bristles with machinery and instruments, impressing the producers of the movie Star Trek: Into Darkness, who used it as a film set for the warp core of the starship Enterprise. 1. Inside the National Ignition Facility (NIF) at Lawrence Livermore National Laboratory, a service system lift allows technicians to access the target chamber interior for inspection and maintenance. The goal of the NIF is to initiate controlled nuclear fusion, in the hopes of creating a new source of energy for our growing world. 7. The target chamber under construction. Holes in the target chamber provide access for the laser beams and viewing ports for NIF diagnostic equipment. 13. NIF’s final optics inspection system, when extended into the target chamber from a diagnostic instrument manipulator, can produce images of all 192 laser final optics assemblies. 18. The interior of the NIF target chamber. The service module carrying technicians can be seen on the left. The target positioner, which holds the target, is on the right. 24. A new viewing window recently installed on the NIF Target Chamber allows members of the NIF team and visitors to see inside the chamber while it is vacuum-sealed for experiments. NIF Team members Bruno Van Wonterghem (left), Jim Nally (pointing) and Rod Saunders watch through the viewing window as the Final Optics Damage Inspection System is deployed. Experiments on Lawrence Livermore National Laboratory’s National Ignition Facility (NIF) are providing scientists with new insights into the turbulent after-effects of a supernova explosion. The studies also could inform efforts to achieve self-sustaining nuclear fusion on NIF and other high-energy laser systems. When stars of a certain mass collapse and then violently explode, material called ejecta expands rapidly and is then decelerated by the surrounding circumstellar medium. This results in Rayleigh-Taylor (RT) hydrodynamic instabilities — the mixing of denser with less-dense material. The same instabilities can affect the performance of inertial confinement fusion (ICF) and high-energy density (HED) science experiments such as those conducted on NIF, the world’s highest-energy laser system. The instabilities can cause too much target capsule material to mix with the fuel, quenching the fusion reaction. The supernova studies, conducted by an international team of researchers led by the University of Michigan (UM) and LLNL physicists Hye-Sook Park and Channing Huntington, found that high energy fluxes and the resulting heat could reduce RT growth in supernova remnants (SNRs) — something previous astrophysics models had not considered. The results were reported in a Nature Communications paper published online on April 19. The supernova studies originated shortly after NIF became operational as a way to begin involving academic institutions in NIF experiments — an effort that has grown into the current Discovery Science program in which external institutions compete for time on NIF to conduct experimental campaigns (see NIF Users Bring Ideas and Energy to Discovery Science). U- was studying RT instabilities in the context of the cosmic shocks produced by supernova explosions, “and NIF is really good at generating high-energy fluxes, using the hohlraum, that are transported via thermal heat conduction and radiation transport — that’s one of the things that we can do easily,” Park said. The experiments regained momentum when Park became aware of a new experimental platform developed by Los Alamos National Laboratory (LANL) (see Shock/Shear’ Experiments Shed Light on Turbulent Mix). “We designed a target to fit in the halfraum (the half-hohlraum used in the shock/shear experiments),” Park said, “and we did a first set of experiments with a low-flux drive. (a) Schematic of the NIF SNRT target; laser beams incident on the gold hohlraum create the X-ray drive while additional beams impact the large-area backlighter to create the diagnostic X-ray source. A plastic shock tube is attached to the hohlraum. The soft X-rays from the hohlraum create a shock wave in the plastic layer inside the shock tube (b), which decays into a blast wave before crossing the unstable interface and entering the foam. The diagnostic X-ray source creates radiographs by being preferentially absorbed by a tracer layer in the center of the plastic. (c and d) X-ray radiographs of the experiment; the plasma flows upward, and the dark fingers are due to RT instability growth. The color bar indicates the relative transmission for (c) the high-flux case taken at 13 nanoseconds and (d) the low-flux case at 34 nanoseconds. The high-flux case shows significantly lower RT growth. With a new target designed and deployed, the researchers were able to conduct a successful series of nine shots using both low-flux and high-flux drives that demonstrated the effect of high-flux radiation on the subsequent RT growth. They used the results to explore how the large energy fluxes present in supernovae could affect the structure of SNRs and Rayleigh–Taylor growth. Members of the team studying supernova remnants on NIF (from left): NIF Operations Manager Bruno Van Wonterghem, Channing Huntington, Bruce Remington, Carolyn Kuranz, Kirk Flippo and Hye-sook Park. Joining Kuranz, Park and Huntington on the paper were Aaron Miles, Bruce Remington, Harry Robey, Kumar Raman, Steve MacLaren, Shon Prisbrey, Russell Wallace and Dan Kalantar from LLNL; along with John Kline, Kirk Flippo, Willow Wan and Forrest Doss from LANL; Eric Harding from Sandia National Laboratories; Christine Krauland and Emilio Giraldez from General Atomics; and researchers from UM and Florida State University; Ben Gurion, University of the Negev in Israel; and MJ Grosskopf, Simon Fraser University, Canada. The commercialization of laser peening technology — similar to working a metal’s surface with a ballpeen hammer — has been one of the most successful transfers of Lawrence Livermore technology to industry. The laser peening technology, which was originally developed by Battelle in the 1970s and was first commercialized by LSP technologies in 1975, was upgraded by LLNL researchers working with Metal Improvement Co. Inc. The world’s most energetic laser sits in a secure, guarded federal laboratory, but its impact stretches far beyond the one-square-mile site of Lawrence Livermore National Laboratory (LLNL). Since the outset, technologies developed or improved at the Laboratory have led to industry-defining partnerships and products that make millions of Americans’ lives better every day. Even if they’ve never heard of them. “Nearly all of us at this point have flown on an airplane with turbine blades that were laser peened with technology that Livermore commercialized years ago,” said Craig Siders, senior scientist and commercial technology development leader in NIF & Photon Science’s Advanced Photon Technologies program. Laser peening — using intense laser light to improve the quality of a material — had been invented in the 1970s, but had not achieved significant market penetration until LLNL introduced a new laser architecture that provided critical new functionality to the technology. Laser peening is commonplace now, thanks in part to Laboratory research that was spun off into the private sector. In 2003, former LLNL scientists Lloyd Hackel and Brent Dane, together with LLNL CRADA partner Metal Improvement Company (MIC), today part of Curtiss-Wright Corporation, brought the benefits of laser peening to the economy as a whole. The Laboratory’s commercialization process worked: Lawrence Livermore helped develop a cutting-edge technology until it was mature enough to stand on its own. Today, laser peening can exponentially extend the lifespan of an F-22 fighter jet’s airframe. MIC has treated jet engine fan blades on every Airbus A340 passenger plane and hundreds of Boeing 777s and 787s. It’s the third best royalty-producing technology in Lab history. And now, LLNL is offering the opportunity to license and commercialize an extension of laser-peening technology called high velocity laser accelerated deposition (HVLAD) for controlled laser-driven explosive bonding. HVLAD was selected by R&D Magazine as a winner of an R&D 100 Award in 2012. Dawes is a primary conduit between LLNL and industry. When scientists believe they have a breakthrough, they often come to Dawes for advice. Whether that conversation leads to a record of invention, a patent or a Collaborative Research and Development Agreement (CRADA), he’s instrumental in helping keep up with the laser and optics industry and matching research with opportunity. Many of NIF’s 40,000 brand new, specialized optical components represent commercialization opportunities, thanks to the new technologies developed to create them. As the Laboratory advances each dimension of laser and optics technology, companies can follow behind and adopt them as they become available. “All of these features involve leading-edge technologies that are important to the laser industry as a whole as they scale up their power levels,” Dawes says. “There’s marketable technologies there that we’re currently talking to a number of companies about licensing.” For other examples of current laser and optics technologies available for commercialization, see the IPO website. In particular, Dawes brings 35 years of experience in the industry (and some patents of his own) to bear on IPO’s work connecting research with companies. Maintaining long-standing relationships with industry and academic leaders, setting up visits to Livermore and monitoring trade and scientific journals are important tricks of Dawes’ trade. IPO screens every paper slated for journal publication in order to identify possibilities for future commercialization. Details on ongoing CRADAs and licensing are scarce, but the Laboratory’s track record speaks for itself. Anticipating the next generation of lasers is especially fertile ground for partnerships with LLNL’s NIF & Photon Science researchers. Scientists expect these lasers to be so powerful, current optics technologies won’t be able to withstand them. A current CRADA with Electro-Optics Technology (EOT) aims to address one of these. Known for their diode-like Faraday isolators — permitting light to pass in one direction only while preventing harmful backward propagation — EOT, among other industry leaders, got a call from Laboratory researchers with experience in high-power laser performance and component cooling looking for pushing the limits of isolator technologies. EOT was looking to advance applications of new materials, which fit perfectly into the needs for high-power isolators. Together, EOT and LLNL are close to producing a marketable product that will benefit the laser industry as a whole and prepare the Laboratory for advanced high-power laser systems. One such system is the new HAPLS pulsed-laser being installed in the European Union’s Extreme Light Infrastructure (ELI) Beamlines facility in the Czech Republic. The L3-HAPLS laser system, installed at the ELI Beamlines Research Center in Dolní Břežany, Czech Republic. HAPLS (the High-Repetition-Rate Advanced Petawatt Laser System designed, developed and delivered by LLNL) integrates a number of new, efficient, high-power laser and optical technologies that Siders believes will eventually lead to the lasers necessary for inertial fusion energy. It’s a powerful tool for its customer, ELI Beamlines, but it’s also a window for scientists into the future of high-power pulsed lasers and a possible fusion power plant. LLNL researchers partnered with Lasertel Inc. to develop the world’s highest peak power laser diode arrays, representing total peak power of 3.2 megawatts, to power the High-Repetition-Rate Advanced Petawatt Laser System. To drive the diode arrays, LLNL developed and patented a new type of pulsed-power system, which supplies the arrays with electrical power by drawing energy from the grid and converting it to extremely high-current, precisely-shaped electrical pulses. Photo by Damien Jemison/LLNL. “We’re actually looking to provide benefits back from investments that this nation and the Department of Energy have made over four or five decades of research into inertial confinement fusion and inertial fusion energy,” said Siders. While luck is always a component, he added that strategy and ongoing communication are key to maintaining fruitful partnerships. In addition to the significant benefits Lawrence Livermore’s laser and optics research can provide to industry, commercialization can also have a tremendous impact on the scientists themselves. High-power lasers at the National Ignition Facility are focused onto a multi-stepped iron sample at the center of the 10-meter-diameter target chamber. These experiments measure the equation of state of iron under core conditions of large rocky exoplanets. In a paper published today by Nature Astronomy , a team of researchers from Lawrence Livermore National Laboratory (LLNL), Princeton University, Johns Hopkins University and the University of Rochester have provided the first experimentally based mass-radius relationship for a hypothetical pure iron planet at super-Earth core conditions. “Determining the interior structure and composition of these super-Earth planets is challenging but is crucial to understanding the diversity and evolution of planetary systems within our galaxy,” Smith said. As core pressures for even a 5×-Earth-mass planet can reach as high as 2 million atmospheres, a fundamental requirement for constraining exoplanetary composition and interior structure is an accurate determination of the material properties at extreme pressures. Iron (Fe) is a cosmochemically abundant element and, as the dominant constituent of terrestrial planetary cores, is a key material for studying super-Earth interiors. A detailed understanding of the properties of iron at super-Earth conditions is an essential component of the team’s experiments. The experiments were conducted at the LLNL’s National Ignition Facility (NIF). NIF, the world’s largest and most energetic laser, can deliver up to 2 megajoules of laser energy over 30 nanoseconds and provides the necessary laser power and control to ramp compress materials to TPa pressures. The team’s experiments reached peak pressures of 1.4 TPa, four times higher pressure than previous static results, representing core conditions found with a 3-4x Earth mass planet. Co-authors include Dayne Fratanduono, David Braun, Peter Celliers, Suzanne Ali, Amalia Fernandez-Pañella, Richard Kraus, Damian Swift and Jon Eggert from LLNL; Thomas Duffy from Princeton University; June Wicks from Johns Hopkins University; and Gilbert Collins from the University of Rochester. Nearly 20 years ago, researchers conducting experiments on Lawrence Livermore National Laboratory’s (LLNL) Nova Petawatt laser system — the world’s first quadrillion-watt laser — discovered that when the system’s intense short-pulse laser beams struck a thin foil target, an unexpected torrent of high-energy electrons and protons streamed off the back of the target. Earlier this month, an international team of researchers used the Nova Petawatt’s successor, the National Ignition Facility’s (NIF) petawatt-class Advanced Radiographic Capability (ARC), to begin developing an experimental platform that promises to turn Nova’s surprise discovery into a powerful new source of protons to study the extreme conditions deep inside the planets and the stars, enhance targeted tumor therapy and advance the frontiers of high energy density (HED) science. In two NIF Discovery Science experiments, the researchers fired four ARC beamlets at a 33-micron-thick titanium foil, setting up a strong electrostatic sheath field called a Target Normal Sheath Accelerating (TNSA) field perpendicular to the target (normal is a geometric term for perpendicular). As the field blew away from the back of the target, it accelerated high-energy protons and ions from the contamination layer of proton-rich hydrocarbons and water coating the target’s surface, all moving rapidly in the same direction. In the experiments, two of NIF’s 192 beamlines were split to form the four short-pulse ARC beamlets. The beamlets were fired simultaneously for 10 or one picoseconds (trillionths of a second), generating up to 200 terawatts (trillion watts) of power per beamlet. The total of about 700 terawatts in the second experiment was the highest peak power yet generated on NIF. ARC’s high peak power is made possible by a process called chirped-pulse amplification, in which a short, broadband pulse generated by an oscillator is stretched in time to reduce its peak intensity, then amplified at intensities below the damage threshold in the laser amplifiers, and finally compressed to a short pulse and highest peak power in large compressor vessels. The new Discovery Science platform, supported by LLNL’s Laboratory Directed Research and Development (LDRD) program, is designed to study the physics of particle-beam generation at previously unexplored ultra-high short-pulse laser energies and long pulse durations. Coupled to NIF’s 1.8 million joules of ultraviolet energy, the capability will enable myriad HED applications and allow the creation and study of extreme states of matter. After amplification in the NIF laser, the ARC beamlets are compressed in the Target Bay and focused to Target Chamber Center. NIF is the world’s only facility capable of achieving conditions like those in the interiors of stars and giant planets. Using ARC short-pulse generated proton beams for ultrafast heating of matter to extreme states will enable opacity and equation-of-state measurements at unprecedented energy-density states. In addition, “protons deposit their energy very specifically,” noted LLNL postdoc Derek Mariscal, lead experimentalist for the project. “That’s why protons are promising for applications such as tumor therapy. You can send a beam of protons toward a tumor and get it to deposit all of its energy exactly where you want it to without damaging other areas of the body. Along with managing the project, Ma serves as the LLNL liaison with the collaborating institutions: the University of California, San Diego, General Atomics, Oxford University, the SLAC National Accelerator Laboratory, Rutherford Appleton Laboratory, Los Alamos National Laboratory, the University of Alberta and Osaka University. Scott Wilks, who was a member of the team that discovered the TNSA process on the Nova Petawatt laser, is coordinating the theory and modeling effort. Other LLNL team members are Jackson Williams, Nuno Lemos, Hui Chen, Prav Patel, Bruce Remington, Andrew MacPhee, Andreas Kemp, Matt Mcmahon, Art Pak, Sasha Rubenchik, Max Tabak, Steve Hatchett (retired), Mark Sherlock, Andy Mackinnon, Anthony Link, Mark Hermann and Constantin Haefner. The proton acceleration shots were among a weeklong series of Discovery Science experiments on NIF. Four other campaigns studied planar direct-drive hydrodynamics, the iron melt curve for studying magnetospheres and exoplanets, high-pressure compressed carbon and laser-driven magnetic field generation. Principal investigators for those experiments were Alexis Casner from the University of Bordeaux, Russell Hemley from the George Washington University and the Capital/DOE Alliance Center, Justin Wark from Oxford University and Brad Pollock from LLNL. LLNL scientists discovered that at the thermodynamic conditions in Earth’s core, metals such as iron and nickel become electronegative and attract electrons. Image by Adam Connell/TID. At temperatures and pressures found on Earth’s surface, metallic elements are electropositive and lose their valence electrons to form positively charged cations. Metals have free electrons that naturally form compounds with electronegative elements. For example, iron reacts with oxygen to form Fe2O3 – commonly referred to as rust. In contrast, noble gas elements (NGEs), such as argon, neon and xenon — considered the most chemically inert elements – show very little reactivity with other elements. However, in the Earth’s core, the reaction of metals with NGEs is quite different. Lawrence Livermore National Laboratory (LLNL) scientists, in collaboration with researchers at the University of Saskatchewan (UoS), the Carnegie Geophysical Laboratory (GL) and the University of Chicago, challenged this basic chemical phenomenon by examining the possible reaction between iron and nickel with xenon at thermodynamic conditions like those found in Earth’s core. Using synchrotron X-ray diffraction and Raman spectroscopy diagnostics in concert with first principles calculations, they discovered that it is possible to create stable xenon iron/nickel intermetallic compounds at Earth-core thermodynamic conditions. The experimental team used a natural iron meteorite, which fell on the Sikhote-Alin mountains in Russia, as a proxy to Earth’s core composition. The research is published in the Feb. 28 edition of Physical Review Letters. “We targeted iron/nickel-xenon reactions at pressures greater than 2 million times Earth’s atmospheric (surface) pressure and temperatures above 2000 Kelvin to simulate thermodynamic conditions representative of Earth’s core. Our aim was to solve the missing xenon paradox, that is xenon depletion in Earth’s atmosphere,” explained lead author, Elissaios (Elis) Stavrou, an LLNL physicist. “In spite of our intentions, Elis and I were floored when, at the X-ray beamline [Advanced Photon Source, beamline GSECARS. ], a clear signature of a reaction between iron and nickel with xenon was signaled by the diffraction pattern,” added LLNL physical chemist Joe Zaug. If this discovery were not enough, a transformative process was found to attribute the process where xenon reacted with metallic elements. Calculations by UoS and GL theorists Yansun Yao and Hanyu Liu revealed that at these conditions, iron and nickel metals become extraordinarily electronegative and attracted electrons away from xenon. The results indicate the changing chemical properties of elements under extreme conditions where elements, which are electropositive at ambient conditions, become electronegative. “A novel periodic table is needed to understand the changing chemical properties of elements under extreme thermodynamic conditions. There are many more systems and paradoxes to resolve. We look forward to writing new chapters about extreme physicochemical phenomena,” Stavrou said. Researchers contributing to the work include Yansun Yao of University of Saskatchewan, Alexander Goncharov, Sergey Lobanov and Hanyu Liu of Geophysical Laboratory and Vitali Prakapenka and Eran Greenberg of the Advanced Photon Source/ University of Chicago. This work was partially funded by a Laboratory Directed Research and Development Program project. What will happen during an earthquake? Lawrence Livermore (LLNL) and Lawrence Berkeley (LBNL) national laboratory scientists have used some of the world’s most powerful supercomputers to model ground shaking for a magnitude (M) 7.0 earthquake on the Hayward fault and show more realistic motions than ever before. The research appears in Geophysical Research Letters. Past simulations resolved ground motions from low frequencies up to 0.5-1 Hertz (vibrations per second). The new simulations are resolved up to 4-5 Hertz (Hz), representing a four to eight times increase in the resolved frequencies. Motions with these frequencies can be used to evaluate how buildings respond to shaking. The simulations rely on the LLNL-developed SW4 seismic simulation program and the current best representation of the three-dimensional (3D) earth (geology and surface topography from the USGS) to compute seismic wave ground shaking throughout the San Francisco Bay Area. 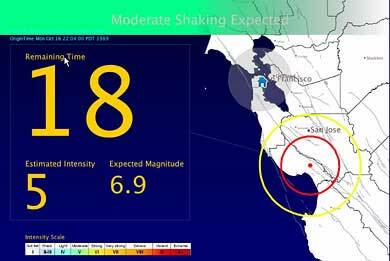 The results are, on average, consistent with models based on actual recorded earthquake motions from around the world. “This study shows that powerful supercomputing can be used to calculate earthquake shaking on a large, regional scale with more realism than we’ve ever been able to produce before,” said Artie Rodgers, LLNL seismologist and lead author of the paper. The Hayward fault is a major strike-slip fault on the eastern side of the Bay Area. This fault is capable of M 7 earthquakes and presents significant ground motion hazard to the heavily populated East Bay, including the cities of Oakland, Berkeley, Hayward and Fremont. The last major rupture occured in 1868 with an M 6.8-7.0 event. Instrumental observations of this earthquake were not available at the time. However, historical reports from the few thousand people who lived in the East Bay at the time indicate major damage to structures. “We’re not expecting to forecast the specifics of shaking from a future M 7 Hayward fault earthquake, but this study demonstrates that fully deterministic 3D simulations with frequencies up to 4 Hz are now possible. We get good agreement with ground motion models derived from actual recordings and we can investigate the impact of source, path and site effects on ground motions,” Rodgers said. For residents of the East Bay, the simulations specifically show stronger ground motions on the eastern side of the fault (Orinda, Moraga) compared to the western side (Berkeley, Oakland). This results from different geologic materials — deep weaker sedimentary rocks that form the East Bay Hills. Evaluation and improvement of the 3D earth model is the subject of current research, for example using the Jan. 4, 2018 M 4.4 Berkeley earthquake that was widely felt around the northern Hayward fault. Ground motion simulations of large earthquakes are gaining acceptance as computational methods improve, computing resources become more powerful and representations of 3D earth structure and earthquake sources become more realistic. This work is part of the DOE’s Exascale Computing Project (ECP (link is external)). The ECP is focused on accelerating the delivery of a capable exascale computing ecosystem that delivers 50 times more computational science and data analytic application power than possible with DOE HPC systems such as Titan (ORNL) and Sequoia (LLNL), with the goal to launch a U.S. exascale ecosystem by 2021. The ECP is a collaborative effort of two Department of Energy organizations — the DOE Office of Science and the National Nuclear Security Administration (link is external). Among the many discoveries on matter at high pressure that garnered him the Nobel Prize in 1946, scientist Percy Bridgman discovered five different crystalline forms of water ice, ushering in more than 100 years of research into how ice behaves under extreme conditions. One of the most intriguing properties of water is that it may become superionic when heated to several thousand degrees at high pressure, similar to the conditions inside giant planets like Uranus and Neptune. This exotic state of water is characterized by liquid-like hydrogen ions moving within a solid lattice of oxygen. Since this was first predicted in 1988, many research groups in the field have confirmed and refined numerical simulations, while others used static compression techniques to explore the phase diagram of water at high pressure. While indirect signatures were observed, no research group has been able to identify experimental evidence for superionic water ice — until now. In a paper published today by Nature Physics , a research team from Lawrence Livermore National Laboratory (LLNL), the University of California, Berkeley and the University of Rochester provides experimental evidence for superionic conduction in water ice at planetary interior conditions, verifying the 30-year-old prediction. Using shock compression, the team identified thermodynamic signatures showing that ice melts near 5000 Kelvin (K) at 200 gigapascals (GPa — 2 million times Earth’s atmosphere) — 4000 K higher than the melting point at 0.5 megabar (Mbar) and almost the surface temperature of the sun. Using diamond anvil cells (DAC), the team applied 2.5 GPa of pressure (25 thousand atmospheres) to pre-compress water into the room-temperature ice VII, a cubic crystalline form that is different from “ice-cube” hexagonal ice, in addition to being 60 percent denser than water at ambient pressure and temperature. They then shifted to the University of Rochester’s Laboratory for Laser Energetics (LLE) to perform laser-driven shock compression of the pre-compressed cells. They focused up to six intense beams of LLE’s Omega-60 laser, delivering a 1 nanosecond pulse of UV light onto one of the diamonds. This launched strong shock waves of several hundred GPa into the sample, to compress and heat the water ice at the same time. “Because we pre-compressed the water, there is less shock-heating than if we shock-compressed ambient liquid water, allowing us to access much colder states at high pressure than in previous shock compression studies, so that we could reach the predicted stability domain of superionic ice,” Millot said. The team used interferometric ultrafast velocimetry and pyrometry to characterize the optical properties of the shocked compressed water and determine its thermodynamic properties during the brief 10-20 nanosecond duration of the experiment, before pressure release waves decompressed the sample and vaporized the diamonds and the water. “These are very challenging experiments, so it was really exciting to see that we could learn so much from the data — especially since we spent about two years making the measurements and two more years developing the methods to analyze the data,” Millot said. This work also has important implications for planetary science because Uranus and Neptune might contain vast amount of superionic water ice. Planetary scientists believe these giant planets are made primarily of a carbon, hydrogen, oxygen and nitrogen (C-H-O-N) mixture that corresponds to 65 percent water by mass, mixed with ammonia and methane. Many scientists envision these planets with fully fluid convecting interiors. Now, the experimental discovery of superionic ice should give more strength to a new picture for these objects with a relatively thin layer of fluid and a large “mantle” of superionic ice. In fact, such a structure was proposed a decade ago — based on dynamo simulation — to explain the unusual magnetic fields of these planets. This is particularly relevant as NASA is considering launching a probe to Uranus and/or Neptune, in the footsteps of the successful Cassini and Juno missions to Saturn and Jupiter. Looking ahead, the team plans to push to higher pre-compression and extend the technique to other materials, such as helium, that would be more representative of planets like Saturn and Jupiter. Co-authors include Hamel, Peter Celliers, Coppari, Dayne Fratanduono, Damian Swift and Jon Eggert from LLNL; Jeanloz from UC Berkeley; and Ryan Rygg and Gilbert Collins, previously at LLNL and now at the University of Rochester. The experiments also were supported by target fabrication efforts by LLNL’s Stephanie Uhlich, Antonio Correa Barrios, Carol Davis, Jim Emig, Eric Folsom, Renee Posadas Soriano, Walter Unites and Timothy Uphaus.